Ni Ketut Marni was born in the village of village of Kebon in the town of Singapadu, district of Gianyar, Bali. Born into a family of traditional dancers and musicians, Ni Ketut has studied Balinese dance from a very young age. She graduated from SMKI, the Traditional School of Performing Arts in Denpasar, Bali with a major in Dance, and has performed for TVRI (Television of the Republic of Indonesia). She first performed with Gamelan Tunas Mekar at the Bali Arts Festival in Denpasar in 1996. Ni Ketut teaches with her husband Pak Made and resides with him in Colorado Springs, Colorado where she instructs the Colorado College Gamelan Tunjung Sari dance program. She has performed Balinese and Javanese dance in Indonesia, Taiwan, Japan, and the United States, and directs the Balinese dance program for Sanggar Manik Galih. Guest Balinese dancer Ni Ketut Marni. Photo by Miranda Fan. Putu, born in Surakarta, Java, is a graduate of the University of Colorado Colorado Springs with a degree in Visual and Performing Arts and has a Masters in Integrative Studies from University of California San Diego. He is currently working on his Ph.D. in Ethnomusicology at University of Illinois at Urbana-Champaign. Putu was formerly Gamelan Director at the University of San Diego, Gamelan Instructor at The Museum School of San Diego and a Percussion Instructor at Broadmoor Academy of Music. He continues to study Balinese music and dance with his father Pak Lasmawan, and assists in teaching ensembles at UCCS, Colorado College and CU Boulder. Putu has performed with Gamelan Tunas Mekar—as both musician and dancer—and the gamelan orchestras of UCCS, the University of Colorado Boulder, Colorado College, Naropa University, the University of Wyoming, Metropolitan State University of Denver, California Institute of the Arts, and the University of Illinois Urbana-Champaign. 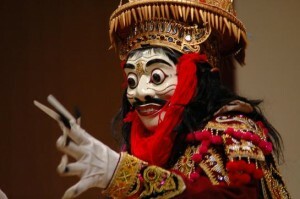 I Putu Tangkas, musician, composer and dancer, performs the Jauk Mask Dance. Photo by Miranda Fan.